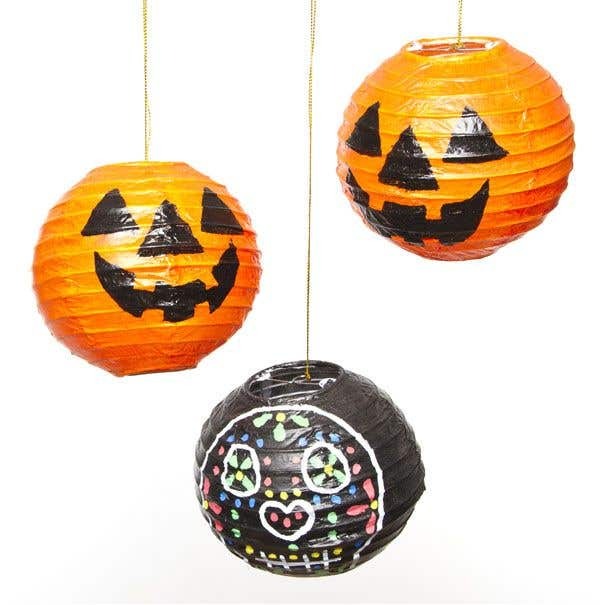 Carefully open out the paper lanterns and ease them into neat round balls. Insert the metal spine into the centre of the lantern, through the hole in the top and ease into position to secure. With the paint brush and acrylic paint, begin to apply the base colour to the surface of the lantern. Work with small amounts of paint at a time to prevent the thin paper of the lantern becoming soggy and work in smooth brush strokes around the entire surface of the lantern until it is fully covered. Set aside for a few hours to dry fully. Once the paint is dry, work over the surface again to give a second coat of paint, to ensure maximum coverage. Set aside for a few hours to dry fully. After the back colour has fully dried, use a pencil to mark out the chosen designs. 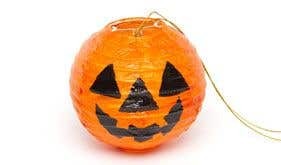 For the Jack O'Lantern, draw out the outlines for the cutaway shapes that would appear on the lantern. For the sugar skulls, lightly sketch the outline of the skulls and features. Paint in the motifs. 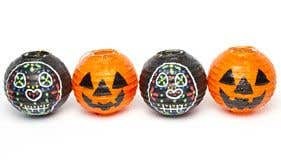 For the Jack O'Lantern design, work with black acrylic paint and neatly paint in the shapes of the features and leave to dry. 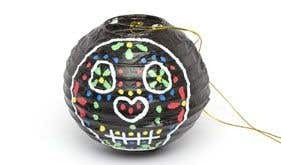 For the sugar skulls, work with Deco Pens to mark out the features of the skull in white, before adding the colourful decorations in red, yellow, blue and green. Allow to dry fully and add a second coat if needed.